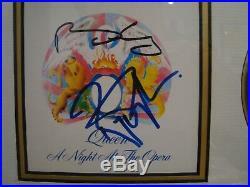 Queen – Brian May & Roger Taylor Hand Signed Picture Display. A professionally framed and mounted A Night At The Opera picture & cd album, sleeve display. 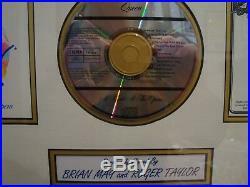 Hand signed by Brian May & Roger Taylor. Complete with 4 pictures. A really special item would make an amazing present for any Queen fan or why not treat yourself? Alternatively would be superb for charity auctions this should make big profits due its rarity and popularity of the the artist. Sourced from one of the finest in-person dealers in the business and 100% trusted by A1. Comes with a certificate of authenticity. Please bear in mind the pictures on here do not do this item justice, our camera picked up a lot of glare and reflection. The actual item will not. About A1 Sporting Speakers. Books from Gazza Jimmy Greaves Wayne Rooney and many more will be available as well as new releases from Luis Suarez and the forthcoming Steven Gerrard book. We will also be offering signed non sports memorabilia such as our signed music memorabilia and film memorabilia. Tickets for the shows we will be doing will also be available here with chances to meet Sir Geoff Hurst , Gordon Banks and other members of 66 properly at exclusive smaller events we will be conducting in the coming months and years. There will be special restaurant vouchers to dine in some very special places and we are hoping to be promoting a few theatre shows later with some new and exciting names. We like to think our reputation precedes us and over the years we have had many thousands of happy customers. Any questions or customer service please call Terry on 07973 387294 or Freda on 07866 454714. With the marketplace now flooded with fakes it is very difficult to distinguish between genuine items that have to potential to increase in value and worthless counterfeits. A1 Sporting Speakers puts its name to every item because all of our signed items are 100% genuinely hand-signed. We conduct official signing sessions, where every star is paid for each individual signature. There can be no marketplace without these celebrities so we consider it fair to pay them for their signatures. We worked extensively with the late greats. Sir Henry Coper and Alan Ball. Certificate of Authenticity – Each item comes with a COA issued by A1 Sporting Speakers Verifiable company history – A1 Sporting Speakers is a registered UK Ltd company and have been trading for over 15 years. Exclusive contracts – We have had many exclusive contracts with sport legends such as Sir Geoff Hurst, Pele, Jimmy Greaves & the members of the England 1966 World Cup Winning team. Our events company A1 Sporting Speakers enables you have direct access to see the legends of sport live and allows us close contact with sporting greats. High quality of products – We have the highest possible standards for our products. Product range – An ever changing and stunning range of over 100 unique products and growing! 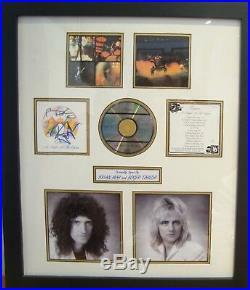 The item “Queen Brian May & Roger Taylor Hand Signed Album & Picture Display with COA” is in sale since Saturday, March 3, 2018. This item is in the category “Collectables\Autographs\Certified Original Autographs\Music”. The seller is “a1-sporting-speakers” and is located in Christchurch, Dorset. This item can be shipped to United Kingdom, Austria, Belgium, Bulgaria, Croatia, Cyprus, Czech republic, Denmark, Estonia, Finland, France, Germany, Greece, Hungary, Ireland, Italy, Latvia, Lithuania, Luxembourg, Malta, Netherlands, Poland, Portugal, Romania, Slovakia, Slovenia, Spain, Sweden, Australia, United States, Canada, Brazil, Japan, New Zealand, China, Israel, Hong Kong, Norway, Indonesia, Malaysia, Mexico, Singapore, South Korea, Switzerland, Taiwan, Thailand, Saudi arabia, South africa, United arab emirates, Chile, Antigua and barbuda, Bangladesh, Belize, Bermuda, Bolivia, Barbados, Brunei darussalam, Cayman islands, Dominica, Ecuador, Egypt, Guernsey, Gibraltar, Guadeloupe, Grenada, French guiana, Iceland, Jersey, Jordan, Cambodia, Saint kitts and nevis, Saint lucia, Liechtenstein, Sri lanka, Macao, Monaco, Maldives, Montserrat, Martinique, Nicaragua, Oman, Pakistan, Peru, Paraguay, Reunion, Turks and caicos islands, Aruba.